A piece of soft and fluffy white goose down alternative comforter with corner tab would be a nice housewarming gift idea for new home owners. Snuggling under a soft, fluffy, warm and comfortable comforter when sleeping has such a luxurious and pampered feel. This translates to a comfortable and sound sleep. 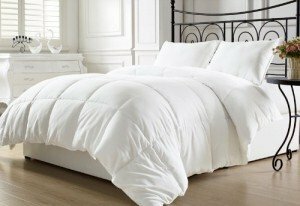 The Chezmoi Collection white goose down alternative comforter comes in queen and king size. The king size comforter comes in a size of 102″x90″ whereas the queen size is 88″ x 88″ in size. Getting a king size comforter for a queen size bed will result in the comforter draping nicely past the mattress. Made from 100-Percent Hypo-allergenic, allergy free Poly Fiber, this helps to minimize allergic reactions. 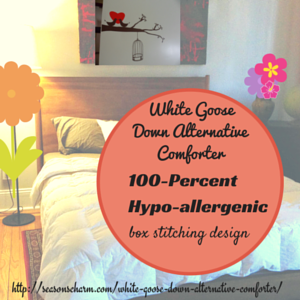 This goose down alternative comforter or duvet has a box stitching design. This helps to prevent shifting of the inside fibers. Piped edges for durability and 4 corner tabs help to secure the duvet cover. You can wash it under a cold wash cycle. Snuggling under a soft and fluffy comforter has really such a good feel to it. The Chezmoi Collection white goose down alternative comforter with corner tab is indeed a cozy housewarming gift to receive.